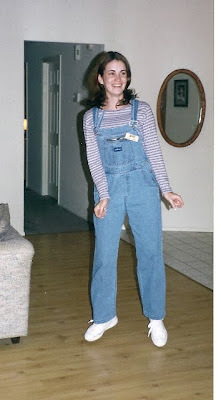 The Loves of Jenn: I rock overalls! There are so many reasons for me to love my best friend Randi. "Happy 90210 day to my best good friend! I just noticed that it is 9.02.10. And you are the only person who would appreciate it like I did. Its early and it gave me the giggles! And made me want black tie cheesecake........"
Randi and I watched 90210 like it was our religion. Every Wednesday night we would go to Olive Garden and get soup, salad, and bread sticks to go (along with two pieces of black tie cheesecake). We'd take it back to Randi's house and watch 90210 and Melrose. Yes, we're that old. We felt a special connection to the 90210 gang because they, like us, graduated high school in 1993. Ah, memories! Good times people, good times! Those are my Express overalls that I remember well and wore often. I wish I still had them because wouldn't they be awesome for a 90's party sometime...or perhaps a square dance. I am dancing in the picture, that's not how I stand. Nice moves Jenn, nice moves! And just to top it off, she sent one of Shaun and I together. There are so many things wrong with this photo but it made me laugh so hard. First, I am wearing some sort of name tag. I do not remember this night (I'm guessing drinks were involved) and have no idea why I would need a name tag (we were at Randi and James' house). That shirt doesn't show off my overalls enough. The stripes take away from the genius that is the overalls. My hair? I won't even go there. Then there is the goofball standing behind me. Yes folks, that's the man I married. In fact, we got engaged just a few short months after this photo was taken. What can I say? He is a sucker for overalls. I love you Randi! Thanks for giving me a HUGE laugh today! I miss my overalls sometimes...all 5 pairs of them! HA! that is hilarious. what a fabulous memory of 90210 with olive garden. everyone needs a memory like that. and even though we can laugh now, you were way hot in your overalls back then. i think you hair looked cute. I love your overalls! They were popular when I was in high school in the '70's. Must be just about time for them to come back into fashion! 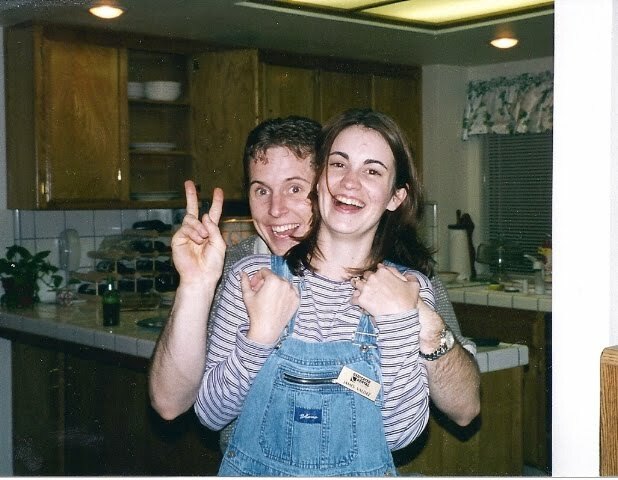 I rocked the overalls too! I actually had a very similar pair with the zippered pocket. 90210 was the best, I graduated in 95, just a few years younger than you...lol. Love it!! We grew up in a great time with 90210 and Melrose. Good times indeed. You are so much fun and I wore overalls all the time too, as well as overall shorts!!!! I just saw two pairs of overalls in my closet the other day and I STILL can't part with them. Mind you, I'm not wearing them, but they could be good costuming some day!